For the water is deep and full of mystery. Your Surigao Island Tour would not be complete if you haven’t seen and taken a dip into the crystal clear waters of the Enchanted River of Hinatuan. 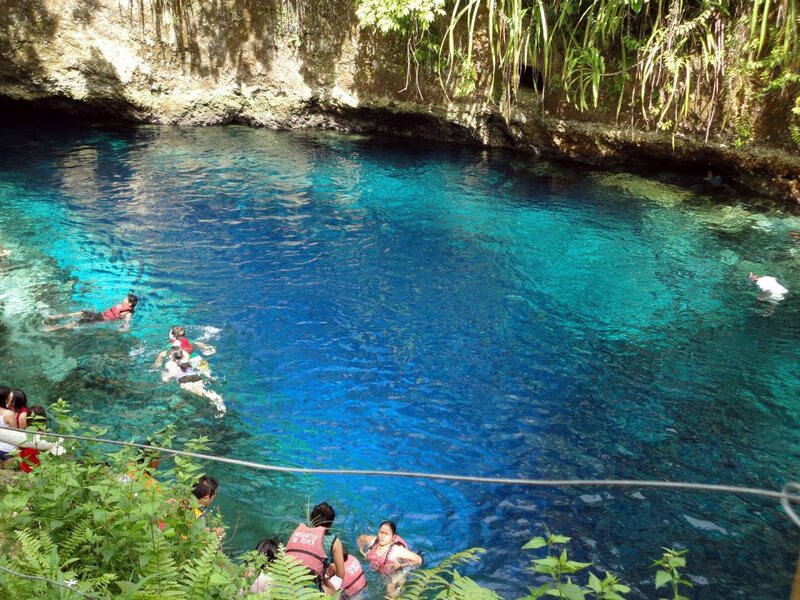 It is situated 30-minutes from the town of Hinatuan. This destination has become one of the country’s most popular tourist attractions. It hasn’t been long since this river was discovered by the locals. However up to this very day, no one has solved the mystery as to where the water really came from. Some say it is from the sea while others claim that it is from the spring. But for wherever it came, one thing is certain, that the water is deep and full of mystery. The locals believe that this place has become a dwelling place for unseen creatures like fairies, pixies and mermaids. They also serve as the guardians of this place to protect it from outsiders. According to the caretaker and lifeguard of this river, there were unexplained bodily pains, itchiness and other skin problems that some have experienced after taking a bath in the river. Perhaps these people have not shown respect that’s why they were given these minor punishments. There is another interesting thing about this river. It is so deep that up to this day, no one has ever reached the bottom of it. Many foreigners attempted to break the record but none had succeeded. Most people who swim only go to the shallow part of the water. The area where the water’s color is between aquamarine to blue. At exactly 12 noon, the caretaker rings his bell which is a signal for everyone to vacate the area as it will be feeding time for the fish. The “Hymn of Hinatuan” is played in the background and several kinds of fish appear out of nowhere. It is such a wonderful experience seeing a live aquarium with all kinds of fish beating one another as to which among them could get the food first. The caretaker usually feeds them with leftover rice, shrimps and other food scraps. Around the premises, there are several cottages selling all kinds of seafood. You can pick and have them cooked for you at a reasonable price. Swimming is not allowed at night as the locals believe that around this time, it is reserved for those that we cannot see. If this is not enough reason for you go on a Surigao Island Tour, then I’ll tell you of two more reasons that would surely convince you to try this best summer destination. In my next posts, I’ll tell you about the majestic waterfall of Surigao and the interesting islets of Britannia. During this Surigao Island Tour, it would be best if you could get the services of a travel agency like www.discovermtapo.com. This would not only make your vacation stress free but also safe. Surigao is a bit of a laid-back town and the transportation is not that convenient. The accommodations are also limited hence, in order to save you time and energy in booking then I strongly suggest you take the services of a tour package company.